The California credit union has deployed a fleet of machines that bypass the member-to-teller schlep with the receipt. Direct-depositing coin counters add efficiency at the front and back ends. The machines increase capacity, lower maintenance costs, and offer robust reporting. The notion of “direct deposit” is taking on additional meaning at Wescom Credit Union ($3.7B, Pasadena, CA). New coin-counting machines at the California cooperative allow members to deposit cash directly into a checking or savings account. The machines save time for members, who don’t have to take the receipt to the teller window, and for tellers, who don’t have to manually process deposits. Wescom presents the coin counters as private “coin booths” ― a nod to its roots as a telcom credit union ― and, so far, the booths have proven popular. Deposits via minted currency have jumped since Wescom rolled out the coin counters across its 22-branch network throughout 2016. The credit union has more than 190,000 members who have brought in $347,202.39 per month on average in coin deposits this year through October. Wescom places its “coin booths” off the main lobbies, offering privacy and noise reduction. For the year, the credit union expects to end up at $4.2 million in pennies, nickels, dimes, quarters, and the occasional 50-cent piece and dollar coin. That compares to $3.9 million for 2016, while the new machines were being placed, and $3.7 million in coins in 2013, when the monthly average was $304,849.02. 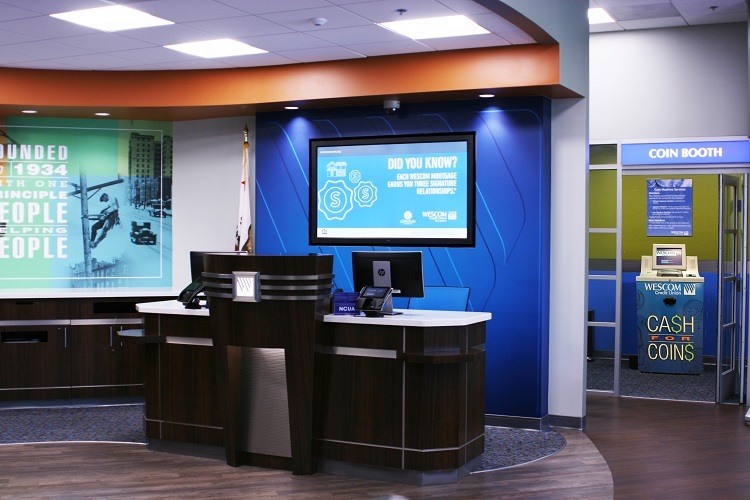 Branch totals vary widely, from $5,998.07 a month year-to-date at the Oxnard branch to $27,645.25 at the West Covina branch. According to Kathie Chism, vice president of branch operations for 11 of the credit union’s locations, approximately 80% of the deposits go into checking accounts. With a $541.1 million balance in share draft accounts as of third quarter 2017, that might seem like small change, but that’s not what this is all about. 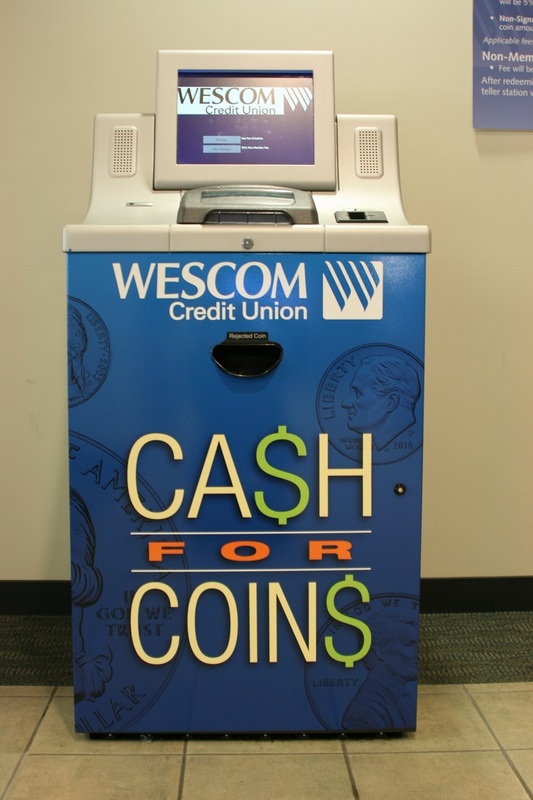 Wescom Credit Union uses coin counting machines from Cummins Allison. Find your next solution in Callahan’s online Buyer’s Guide. Browse hundreds of supplier profiles by name, keyword, or service areas. Start today. The credit union tiers usage fees according to its Signature Membership program. Approximately 35% of its members are in the highest tier and enjoy unlimited fee waivers. Another 31% get 12 fee waivers per year. The 22% of the membership who are not Signature Membership participants pay 5% per coinage redeemed. Youth accounts are fee-free all the time. Non-members account for 8% of the machine’s use and pay 10% per coinage redeemed. Chism says total fee income is not significant, running between $1,400 and $1,800 a month. More than 190,000 Wescom members have brought in nearly $350,000 in coin deposits on average every month this year through October. Although the direct deposit feature sealed the deal, there are other functional benefits to the new machines. They are quieter, for one. And the fact they are less prone to jamming combined with other operating issues has saved the credit union thousands in maintenance costs. Plus, the machines have greater physical capacity and offer a more robust reporting functionality than the coin counters they replaced, Chism says. “That improved service to the member ― seeing their deposit immediately credited ― is really the top selling point,” Chism says. Improved service also comes in the form of teller attention. The machines free staff from mundane transactions so they can focus on members with more high-priority items. To offer direct deposit, the coin machines are integrated into the core processing system. This eliminates the hassle of dealing with lost receipts. On the back side, the improved, on-screen reporting simplifies balancing the general ledger and tracking inventory and usage. “The audit trail is great,” Chism says. Gosh, that is far more than I'd have expected. Fun read, Marc! I would never have guessed that members would be making that many deposits in coin! But I guess if it is convenient, easy and convenient, those jars of pennies, nickels, dimes, and quarters are routinely brought in regularly. Thanks, Jim. Yep, it's not much in terms of percentage of total deposits but it's a lot of change. And one more good way to keep member service sticky. Thanks for commenting.